Personal Articles Floater | Special Feature | Recreational Vehicles Personal | Webinars | TRIVIA! What do Hot Wheels and Barbie dolls have in common, besides being the #1 boy and #1 girl toy of all time? Ruth Handler created the first Barbie doll in 1959 and named it for her daughter, Barbara. In 1968, Elliot Handler created the original Hot Wheels to be a more "tricked out" version of the then more realistic Matchbox cars. Ruth and Elliot were husband and wife. Large collectors of the toys tend to be very passionate about them, usually starting in childhood. The woman with the largest Barbie collection runs a "hospital" where she fixes broken Barbies. The man with the largest Hot Wheels collection (valued at over $1 million) even had his home office designed to resemble Elliot's office in 1970. Collectors of other iconic and lesser-known toys also tend to be equally devoted if not more so. Some collections may be extensive and include rare specimens and not really be worth anything, such as this collection of over 11,000 "Do Not Disturb" signs. Other collections are worth a wee bit more. Your own clients' collections will likely fall somewhere between, with some requiring detailed planning to protect them, including insurance. The Personal Articles Floater on Big "I" Markets offers customized products and services for commercial and personal inland marine fine art and valuable articles. Coverage is available for museums, galleries, private dealers and corporate collections as well as private fine art collections, jewelry, fine wine, silverware, musical instruments, antiques and any collectible imaginable. This program offers many specialized features designed for all types of risks that will appeal to even the most discerning collector, regardless of risk size. The carrier's in-depth knowledge of both personal and commercial exposures allows them to underwrite diverse risks resulting in policies that are individually tailored to meet the unique needs of your insureds. Working with a specialty company that understands the unique elements of these risks leads to the most competitive pricing, considerably broader and more flexible coverage than your standard homeowners insurer, and expert claims handling. Policies are written on an admitted basis. The carrier is rated A XV by A.M. Best. The Personal Articles Floater (which replaces the Stand-alone Fine Arts commercial & personal products) is available on Big "I" Markets in all states (except AK & HI) for both commercial and personal lines. Each year we publish a printed guide for Big "I" Markets, which is delivered to Big "I" member agencies the old-fashioned way, through the mail. We're pleased to offer Two for Tuesday readers a preview of this guide, which gives an overview of most markets available on BIM. You should be receiving one in your agency mailbox very soon! Our cover this year has the phrase, "We are the key for the markets you need today." And that's just how we hope you feel after reading through the wide array of markets available to you as a Big "I" Markets agent. Take a moment to flip through and perhaps discover a gem you hadn't noticed before. 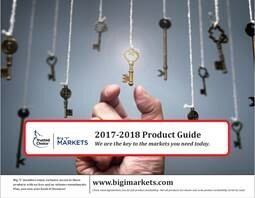 Product availability does vary by state so be sure to log into www.bigimarkets.com for the most up-to-date product listing for your agency. According to the Recreational Vehicle Industry Association, RV wholesale shipments finished 2017 with 504,599 units up, 17.2% compared to the 430,691 units shipped in 2016. December sales were the best ever and 2017 sales were 17% higher than 2016. That's a lot of new RVs on the road nationwide, which spells big opportunity for Big "I" Markets agents. Several trends point to continued growth. Baby Boomers continue to retire, the largest segment of buyers is between 35-54, and an increasing percentage of millennials are buying RVs. Manufacturers are offering innovative new products increasing energy and fuel efficiency, plus solar panels are appearing on more models. This means that there are many first-time buyers that will need a lot of help. Fortunately the RV crowd tend to love to share information, from taking the time to choose the right RV, tips on making that first trip easier and an excellent list of risk avoidance advice because when it comes to low overhangs and bridges, "I think I can make it" is a statement often made just before a call to the insurance company. What seems to be missing in advice among online communities is information about insuring an RV. Many new owners might not be aware their auto doesn't cover some important elements such as Vacation or Full-Timer Liability. Another difference between insuring an RV and a typical car is that RV coverage can often be suspended when the RV is placed in storage. This makes sense, as collision coverage would hardly be an issue when the RV is out of commission and in a long-term storage lot or trailer home. Especially for retired couples on a budget, this is a budget-snipping measure that makes a lot of financial sense. National General knows personal RV coverage and offers many unique coverage options and discounts which are designed specifically to accommodate the avid RVer such as Accident Forgiveness, where a National General customer's first accident will not impact their rates. National General also helps you retain accident-free RV customers with their Diminishing Deductible option. When your RV customers add this option to their policy, 25% of their deductible is waived (up to 100%) for each annual renewal that they have no claims. Optional Full Replacement Cost Coverage - National General gives your client a comparable new RV if theirs is totaled or stolen.1 This protects them from depreciation - they could save thousands! Permanent Attachments Coverage - National General automatically insures permanent attachments for the full amount it would cost to replace them - not a depreciated amount. Designed to provide extended coverages that make sense for RVs. Emergency Expense Allowance - National General will reimburse your client up to $100 per day (maximum $500) for food and lodging if a covered accident leaves them stranded more than 100 miles from home. Provides peace of mind if they ever get stranded. Full-Timer Coverage - For RVers who live in their RV full-time, National General offers specialty coverage with their specific needs in mind. Just the right combination of coverages for those who live in their RVs - not offered by regular car insurance. 1. What is Barbies' full name? 2. On January 15th, 2018 it became illegal in New Jersey to operate what while drunk? 3. What is oxymoronic about the third stanza of the Gilligan's Island theme song? TB - In what year did Airstream officially start production of their famous trailers begining with the Torpedo Car Cruiser? Congratulations to our agent in Congratulations to our agent in Iowa on an Affluent Homeowners New Business sale of $68,894 in premium!